Our Banana Sweetpotato Smoothie uses sweetpotato puree to make a breakfast, lunch, or snack that’s super simple and satisfying. A really easy Sweetpotato and Lentil Curry that's gluten free and vegan, too! Serve it with naan bread and yogurt. If you like carrot cake, you’ll LOVE this sweetpotato snack cake. Why? Because it’s got tons of healthy, tasty, shredded sweetpotatoes in the batter, of course, and they bake up tender, moist, and satisfying. Thick, rich, and flavorful, this chili is loaded with hearty goodies like beans, meat (or substitute brown rice), tomatoes, and of course, big chunks of sweetpotatoes. Sprinkle the chicken with the za’atar, salt, and pepper. In an instant pot on the sauté setting, warm 1 tablespoon of the oil. Add the chicken skin side down and cook until browned, 5 to 6 minutes. Turn the chicken and brown the other side, 2 to 3 minutes. Transfer the chicken to a plate and set aside. Warm the remaining 1 tablespoon of oil in the pot. Add the onion and garlic and cook, stirring occasionally, until softened, 3 to 4 minutes. Add the lemon juice and oregano and scrape up any browned bits on the bottom of the pan. Add the sweetpotatoes, apple, broth, sorghum, water, and a sprinkle of salt and pepper. Arrange the chicken, skin side up, on top of the mixture. Secure the lid, making sure that the steam vent is closed. Switch to the pressure cooker setting and cook for 20 minutes. Release the steam valve and open the lid. Remove the chicken and set it aside. Stir the kale into the mixture in the instant pot. Arrange the sweetpotato and sorghum mixture on plates or a platter, top with the chicken, and serve. Notes: Za’atar is a Middle Eastern spice blend. Look for it in the spice section of your supermarket and at gourmet food stores. For tips on buying and cooking with sorghum, visit www.simplysorghum.com. Line a large rimmed baking sheet with foil. Spread the sweetpotatoes, mushrooms, apples, carrots, celery, kale, onions, sliced lemon, rosemary, and thyme on the foil, then scatter the butter pieces on top. Drizzle with 3 to 4 tablespoons of oil and sprinkle with salt and pepper. Roast until tender, 25 to 30 minutes, tossing occasionally. Meanwhile, in a small bowl whisk together the lemon juice, garlic, and remaining 1/2 cup of oil. Add salt and pepper to taste and set aside. 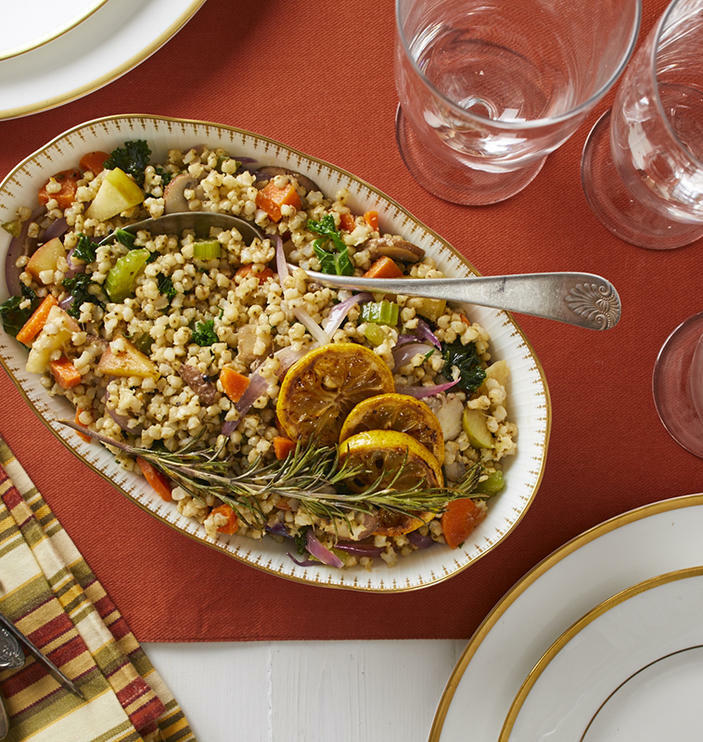 In a large serving bowl, combine the roasted vegetables, sorghum, parsley, sage, and pecans, if using. Drizzle with the lemon-oil mixture and serve. Note: For tips on buying and cooking with sorghum, visit www.simplysorghum.com. How to make mac and cheese healthier, tastier, and creamier? Add sweetpotatoes, of course! Making fries The Easy Way distills the oven-fry method to its most essential steps. This is so close to a classic potato salad that it’s just as perfect for picnics, potlucks, and all your summery occasions.